Description: This project was the first major US airline terminal built after September 11th, and it includes a 362,000 sf main terminal and a 284,000 sf satellite concourse connected by an underground tunnel with a moving walkway. The program for the building comprises traditional airline operations facilities, including baggage claim and baggage recheck areas, a greeter lobby, ticketing hall, an automated passenger transfer system station, and retail spaces. The HVAC system includes demand control ventilation for the areas with highly variable occupancies, such as the ticketing hall, baggage claim, and holding areas. The system enables the owner to significantly reduce cooling and heating energy consumption for off-peak occupancy periods, and ensures that the varying cooling and ventilation demands are met, while effectively minimizing energy usage for heating and cooling. 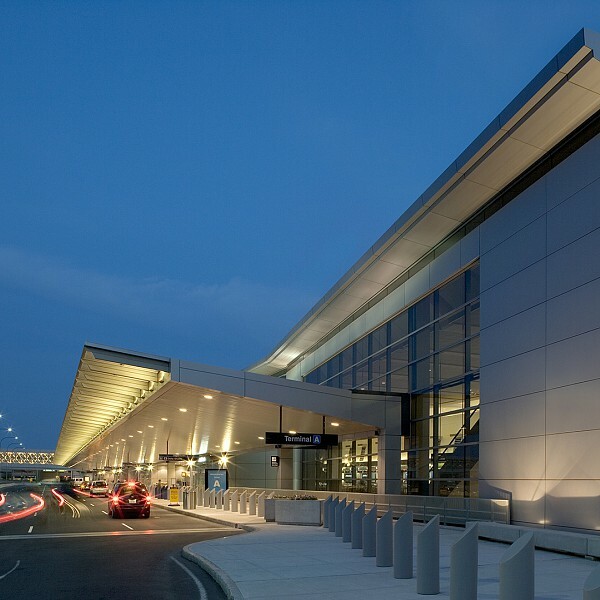 The project, which was designed and engineered to meet Massport’s 2001 guidelines for sustainable airport construction, incorporates such green features as water-efficient plumbing and irrigation, extensive daylighting and high-insulation glass, energy-efficient electric lighting, construction waste recycling, and the use of recycled, local materials. Designed on a fast-track schedule, this building is the world’s first airport facility to achieve LEED certification from the U.S. Green Building Council.